Promise is a group of three sisters that perform Anime and J-pop songs, as well as their own original songs. They debuted in December 2009. The oldest Promise Sister, Leanne, began singing J-pop and Anime Songs when she won her first Anime Karaoke Contest at Onna Fest 05. 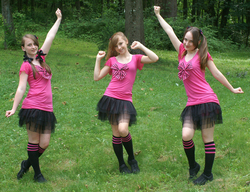 In 2006 the Finnegan sisters formed a 3 sister group and began performing karaoke at various Anime Conventions together. In 2009 the girls decided to become a professional group under the name of "Promise" and they debuted as a guest performance group at Mokucon 2009. Since their debut the have performed at many venues in NYC including DROM and Top Tunes. They appeared in "New York Wave", a documentary about singer Reni Mimura, which aired in Japan on the NHK on March 7th. They also were featured on a page in Reni Mimura's picture book. Promise performed their first full length concert at AnimeNEXT 2010, and currently have concerts featuring their new original songs planned. The Promise Sisters thank their fans for the support!